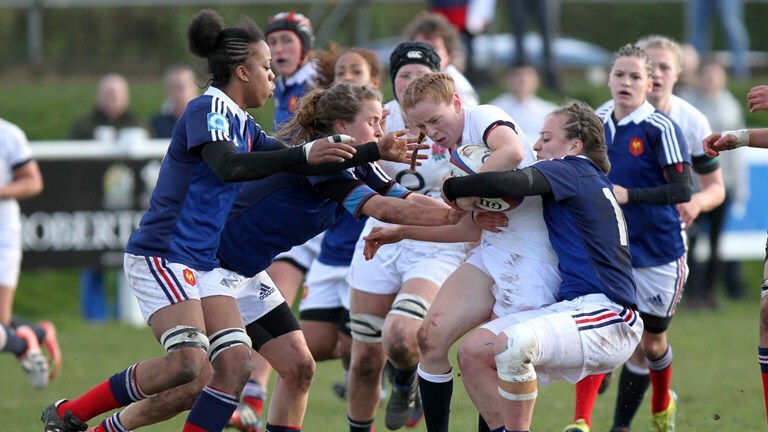 ENGLAND were beaten by France 25-0 at the Stade Sainte-Germaine in Bordeaux this afternoon. The age-group side, who won 25-10 against the Army in the opening game of their season last week, weren’t able to replicate that performance against a very physical and strong French team in testing weather conditions. In the first of two fixtures between England and France over the next month, it was the home side who started quickly scoring in only the second minute. A handling error in the England midfield led to a turnover and quick hands freed up the French right winger Grace Séraphine Okemba to dot down for the first try of the match. France remained on top in the opening exchanges but the wet and windy conditions played a part in a number of errors from both sides. England got into the game midway through the first half with good control and continuity to their play. England’s back row worked hard all over the pitch carrying strongly and making big defensive tackles. But it was France who struck again, doubling their lead to 10-0 on the stroke of half time. The home side maintaining possession for a number of phases before good hands allowed Okemba to race clear again. A last ditch tackle by Saracens winger Lotte Clapp hauled down her opposite number but not before she managed to offload to outside centre Marine Menager who scored France’s second. After the half-time break France extended out to 13-0 in the 48th minute following a successful penalty kick by half back Pauline Bourdon. England looked to strike back moments later after a superb break by inside centre Millie Wood. But it was last gasp defence after England had recycled the ball quickly that prevented the visitors opening their account. Quick hands into space allowed substitute Elise Pignot to score France’s third try in the 70th minute which was successfully converted by Bourdon. Five minutes later France’s fly half Montserrat Amedee finished off proceedings with a fourth try for Les Bleus to make the final score 25-0.